Today, I am happy to announce an upcoming option for operator console in HostedSuite – the desktop Console. Currently there are a couple of options for using the console with HostedSuite. The most common of these is the local server deployment option. 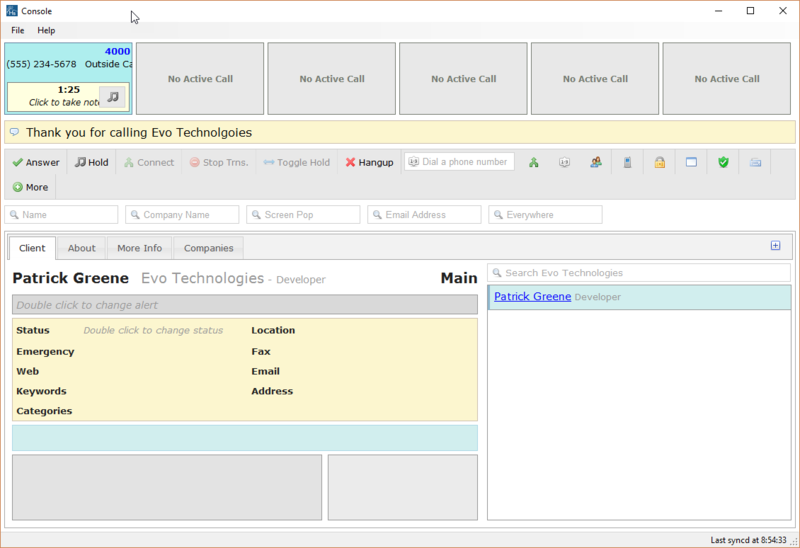 Our most common configuration for virtual call centers that want to use our operator console is to install a local web server application on a server at the facility. This web server provides an operator console and the receptionists connect to it by opening a web browser and going to http://ip-of-server:21483. This has worked pretty well for a lot of our clients, but it does mean that there has to be a PC on site that can run our web server console software and never be shut off. Our second option for purely virtual operations that are also using a SIP based PBX is our soft phone which integrates directly with hostedsuite.com. In this case, you can just start your soft phone and login to https://me.hostedsuite.com and start answering calls. This option is great if you want to answer calls from home and are using a phone system which supports it, but what about those who still want to use a physical phone and don’t have a PC that can be dedicated as a server? This is where our new desktop console comes in. We are currently beta testing our new desktop console option. This is a windows based operator console that an individual operator can install on their PC. The software will synchronize with our hostedsuite.com cloud servers but does not require a local dedicated server! This means that you can run the entire HostedSuite platform on a laptop including scheduling, operator console, client management, and reports but also enjoy all of the benefits of the cloud such as our client portal. The desktop console is very easy to install and has an integrated auto update system for bug patches. Additionally, since it will stay sync’d with our HostedSuite cloud, it can be used anywhere. It functions identically to the HostedSuite operator console that you are already familiar with but does not require any server. Our desktop console currently supports all of the phone systems that we support on HostedSuite including Mitel, Cisco, Broadsoft, Shoretel, Avaya, and Asterisk.